Le Claire Kunst serves an international client list which includes important museums throughout the world and major private collectors. Our company was founded in Hamburg in 1982.
both quality and scholarship. Since 1992, we have continued to establish our activities in the United States. In New York, we have organized several exhibitions. We also exhibit at the Salon du Dessin in Paris, and at the Frieze Masters in London. The gallery’s field of activity covers all the main European Schools of art. We guarantee the authenticity of the artworks we offer for sale. 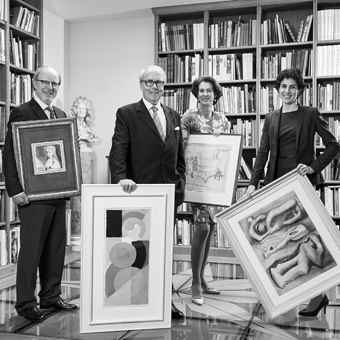 We are also happy to provide impartial, specialised advice to collectors considering an acquisition sourced elsewhere on the market, be it at auction or an art fair, from a private collector or from another gallery. We handle all dealings with the utmost discretion and respect our clients' desire for privacy.